I want to begin this post with an anecdote. My specialty, if you will. One school break (winter, I think), I was at my parent’s house making myself breakfast. As I was heating up the pan to fry an egg (my breakfast of choice since as long as I had a choice) I was chatting with my dad and he started to tell me a story about his father. According to the story, his father had been very particular about the appropriate way to fry an egg, and had often taken over as my dad attempted to fry eggs, telling him he was doing it wrong. Almost immediately after he told me this story we chuckled, then he looked over at me and said ELENA YOU’RE DOING IT WRONG. He pushed me out of the way and fried my egg for me as I fell onto the floor laughing. 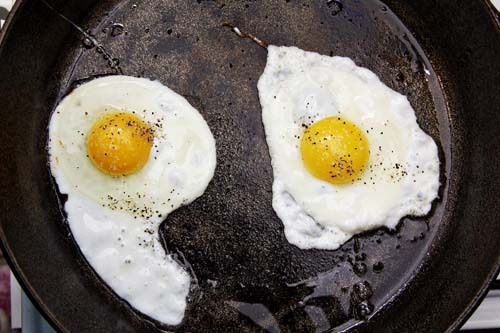 Follow up question– how do you fry an egg the WRONG WAY? Anyhoo, welcome to the last post in The Cast Iron Chronicles. It’s bittersweet, I’ll admit. On one hand, I’m immensely proud of myself for successfully salvaging a wonderful cast iron pan while also managing not to burn the house down or drive Dan crazy with the noise produced while trying to sand and watch Criminal Minds at the same time. On the other, this series has been a lot of fun and the response has been incredible, so I’ll be sad for it to be over. After giving the pan it’s final sanding and a good scrub it was time to gently season it. For those who have just received new pans (or old pans that need to be reseasoned) this is where you pick up the story. 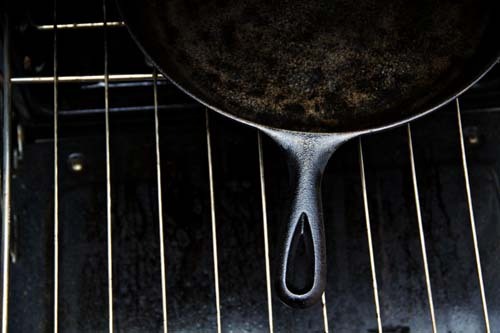 As with everything, how to properly season cast iron is hotly debated on the internets. I’ll tell you what I did, but feel free to consult anyone else who probably knows better than me. 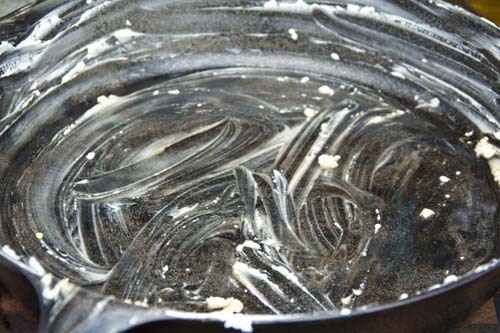 I’ve always been taught that to season a pan you coat it in animal or vegetable fat (or a combination), and put it in a warm oven for an hour. Then you let it cool, rinse, and repeat. That was pretty much what happened here. I alternated between olive oil, shortening, and bacon drippings, giving the pan a thorough coating and then letting it cook in a 200 degree oven for an hour. Then I would let it cool completely, wipe it out, and start all over. I’ve been doing this once or twice a night for about a week, probably a total of 10 times. 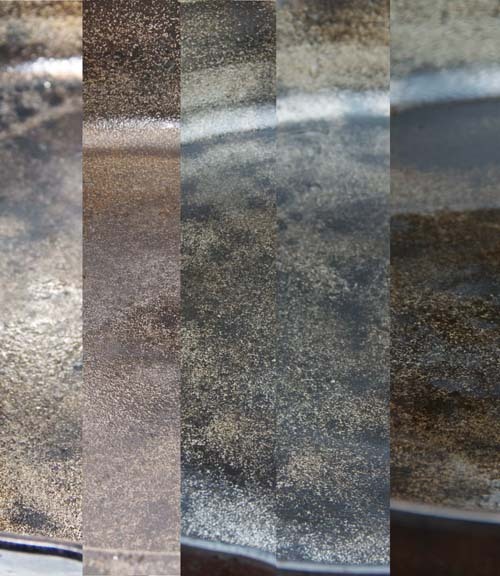 Once the pan looked more charcoal than pewter, I decided to try and cook something in it (the real test). 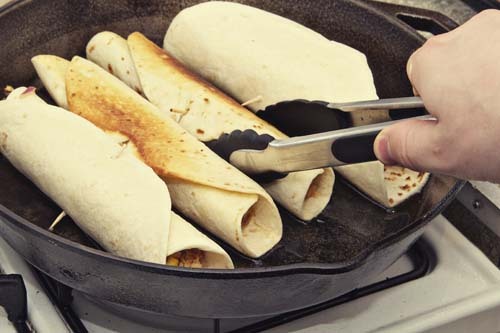 I had intended to christen the pan with bacon, but on Saturday Dan was making taquitos and it just seemed like the pan was the perfect size for four giant taquitos at a time. So, we broke her in with what is essentially a fried taco (yum). The next morning she got her proper porky christening when we made bacon and eggs. 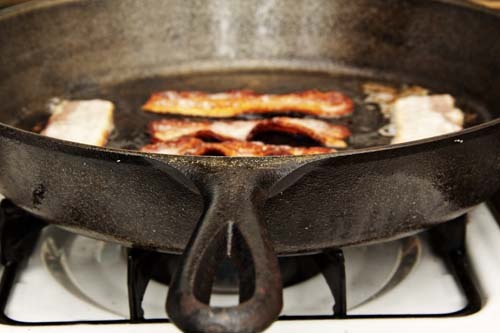 Since then she hasn’t left my stove, and my other cast iron pan is starting to feel jealous. 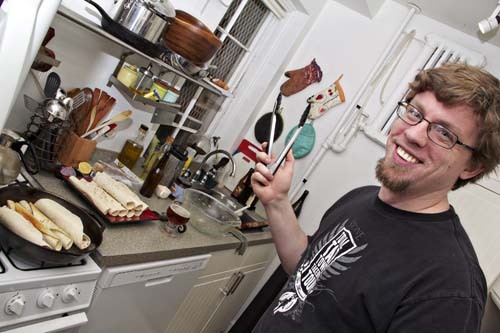 And yes, I’m using female pronouns, because cast iron pans are vessels just like boats. So far, she has been amazing. With each thing that I cook in her she gets a little darker, and I’ve been careful to recoat her with oil after each use because she’s still fragile. This process has been so much fun, I really appreciate you reading along- your support and feedback have been incredible! What has been most exciting for me is the feedback that so many of you feel empowered to try and salvage/reseason your own cast iron. I would love to follow along as you do this, so please send me links to pictures! p.s. Real money says that after I post this I’ll get an email from my dad that explains the ways I’m frying an egg wrong in that top photo. p.p.s. He did email me, but to say that I exaggerated and the story never happened. When I pointed out he had witnesses (my stepmom) he said her memory wasn’t credible. Clearly. I’m also sad that the series is over! I’ve had a fun time reading your posts about this and seeing the pan come together. 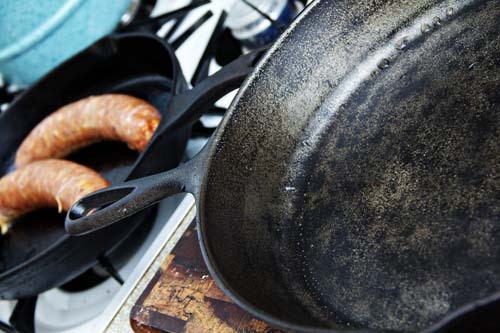 I have a few Lodge cast iron pans that still aren’t really well seasoned, so I’m thinking perhaps I need to do some more seasoning in the oven like you mentioned above. It’s good motivation, since cast iron pans really are fantastic. Thanks for sharing the chronicles! I wish my eggs looked that good in the skillet. Enjoy and love that skillet like a child. I just purchased an old cast iron cornbread skillet. I know nothing of how to clean it or season it, but this series has set me on the right track. Just wanted to say thanks!